Voice technology is turning online grocery shopping into a "continuous" process, the supermarket's online partnerships director has said. Speaking at the IGD Online and Digital Summit in London, Rafael Orta said that, while the number of people regularly using voice controls to add to their shopping lists was still in the thousands, the format was having a noticeable impact on shopper behaviour. "What we’re seeing is a more continuous basket construction," he said. "They build their shopping basket over a few days, before they commit to have it delivered." Voice was proving particularly popular for adding routine essentials like milk to shopping baskets, Orta said. 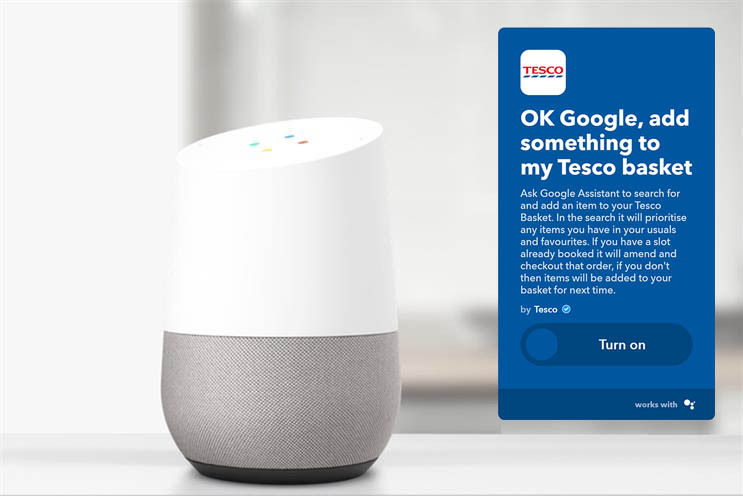 Tesco can be used on both Amazon’s Alexa and Google Home, both as a result of its collaboration with IFTTT, a platform that acts as a go-between for different apps and devices. Orta said Tesco was trying to think of its digital assets as a "platform for partner growth" – both in terms of the FMCG brands it sells, and other partners, such as those involved with the Clubcard programme. "We see ourselves as a network," he said. "How can we bring together the capabilities we have and others have?" He gave the example of Tesco’s partnership with Spoon Guru, incorporating the dietary information platform’s data on the Tesco website. Giving the example of a can of tomatoes, he said Tesco had moved from offering "a couple of tags" of dietary information, to hundreds, thanks to the partnership. Discussing the ongoing "Food love stories" campaign, he said that web content had been integrated with TV and outdoor advertising to make it into a "shopping event". "This is something that very elegantly gives consumers this sense of consistency," Orta said. "But it also provides them a solution – what this consumer is after is an inspired meal, and this is a very simple way to provide that."